Squire had his big Step II CS (clinical skills) exam to take up in L.A. this past week. We decided to make it a family trip so we could all spend a little time visiting with my Granny Shanks. The only problem was, our Jeep has been kind of having a lot of problems lately. The air conditioning? Yeah, it hasn't worked since I got back from visiting my family at the beginning of July. Yeah, we drove, to California - without air-conditioning. About an 8-9 hour drive with kidlets. With no air-conditioning. Here is Squire preparing for that trip, the kids helping him fill the tires for the long drive . . .
And these little ice pack pillow beauties I whipped up for the kids, to help them keep cool? A red-neck solution it was, but work - it did! We got all the way to California and back with no car trouble. 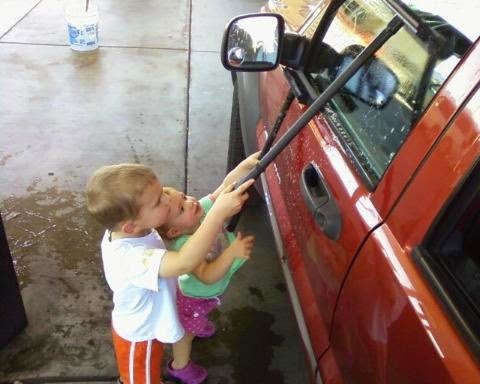 The kids helped to wash our whole car with the window wipers at a gas station called, "Zip" on the way. Little did we know how appropriate the name of the establishment was. As we loaded our kids into the Jeep, we battled about 200 flies that were zipping all over the inside of our cozy space. I am not exaggerating about there being 200+ flies, either. We fought and flailed and shooed those little buggers out the windows for at least an hour. Note to self: Don't go to gas stations that are located right next to large cattle outfits. Oh, and don't leave your windows open at gas stations, either. :) Lesson painfully learned. And one with me, too - in all my sweaty glory. Love that boy's cheesy little face. Lincoln and Atley did great on this leg of the trip. They especially loved the rolling roads leading into Palmdale, where my Granny lives. Crazy, sweaty hair on a happy little girl! We had a fantastic visit with Granny Shanks. My kids haven't seen their Great Granny Shanks since my sister's wedding last May - over a year ago! Atley is a bit stand-offish with people she doesn't know very well. She certainly gives no affection to us or anyone else who she doesn't want to. Which is alright with me! Though, it is a bit sad when we visit family members she doesn't know well, and she doesn't warm up with them in time to have (m)any nice close lovey moments. But, with Granny, she was different. She held Granny's hand to walk into her house from the moment she got out of the car, and was happy to be held, cuddled, tickled, and kissed the rest of the time, too! Gran called Atley her little pal. And she was! Lincoln loved seeing his Great Granny, too. They really enjoyed visiting with and being close to her. Those tortoises, Max and Maxine, they were well-tortured loved during our visit. The two mornings we were there, they were up before six, staring into their little tortoise house, to see if they were awake. I'm pretty sure Lincoln also pulled up half of Granny's back lawn to feed them. Oh, kids. They were very tired after their time at the park and lunch - they slept for 3 hours! Which was great. Gran had a HUGE tote full of family history documents: piles of amazing old photos, (auto)biographies of several ancestors, and a whole lot more. I was able to go through the box with her and get a messenger bag full of precious family documents that I am going to scan, transcribe, and make available to my family through email and www.familysearch.org. I felt like I was going through buried treasure, finding all of that stuff. Happy day! :) The project was so much work it gave Gran a headache, but I am grateful she stuck it out with me - I needed her help to identify many of the people in the photos, and we got a lot of work done together. Plus it was nice to be able to get some time with Gran all to myself while the kids were down. When Squire got back from his 8 hour test (for which he left at 4:55am to beat L.A. traffic), Granny treated us to dinner at the Hometown Buffet. It was delicious. The kids enjoyed dinner, and playing Pat-a-Cake and Itsy Bitsy Spider with Granny before they went down to bed for the night. I love my Gran. Isn't she just beautiful? She is one of my most favorite people in this world. She always makes me feel so loved and more centered on the things that matter most in life. I love spending time with her. I was so sad to go. Squire took a shot of my pregnant belly - 34 weeks, 1 day in this photo. Baby is a comin' soon! And they were done about three or four hours before our trip back to Tucson was complete. But we made it home safe and sound - with fewer flies (and a few more cries) than the leg up to California. All-in-all though, it was a wonderful visit. The only thing that could have made it better, would be for it to have been longer. We love you, Granny! Thank you for the wonderful time!! We hope we can see you again soon! !